Shipping Fine Art is a delicate task that requires proper training, natural skill, extensive knowledge, and, most notably, loads of experience. 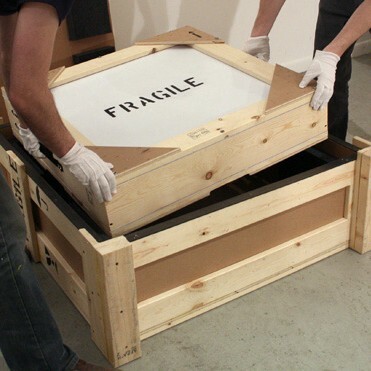 “Experience” is critical to successfully packing and transporting precious, fragile artwork safely. We have developed unique and innovative Fine Art Shipping and packaging techniques not found anywhere else in the industry. You don’t have to be a fancy museum curator to ship fine art these days. Here at the Box Bros, we feel every artist deserves special treatment for their work. Your paintings, sculptures or art installations may not sell like a Picasso original, but they’re still worthy of Picasso quality shipping. Enter the Box Bros, who treat every piece of fine art we package and ship like it’s a Michelangelo. Museum curators (and yes many regular folks) have entrusted the Box Bros with shipping their fine art pieces for the past 25 years. If museums trust us to ship their priceless art pieces—you can rest assured we will do the same for your masterworks. We’re a global shipping and moving company that didn’t just pick up a box; the Box Bros have spent our careers mastering the “art of moving fine art.” We even have an A+ rating from the Better Business Bureau (BBB) for our “outstanding attention to customer needs” to prove it. The Box Brothers has nearly 3 decades experience handling all manners of fine art, from paintings, sculptures, ceramics, glass art, models, statues, large and small display pieces, antique art, museum artwork, medieval art pieces, art installations, historical artifacts, and much more. Will your fine art need extra protection, improved crating or double insulation to keep it insulated from possible damage? Does the room, warehouse and truck temperature need to be maintained during transit to protect your Fine Art investment? Will you need controlled storage when your valuables arrive at their destination? We realize shipping fine art is a delicate task that requires proper training, natural skill, extensive knowledge, and, most notably, years of experience—which is critical to successfully and safely packing and transporting precious, fragile artwork. Over the years, we developed a tried and true process for shipping Fine Art. Our experts devised an innovative packaging technique that you can’t find anywhere else in the industry. That is the power of experience. We have a few “tricks of the trade” up our sleeve to help us do the job right, no matter the size of your masterwork. We would be happy to come to your home and package your fine art on-site in preparation for your move or you can come in today to one of our locations and find out more information on Fine Art Shipping!